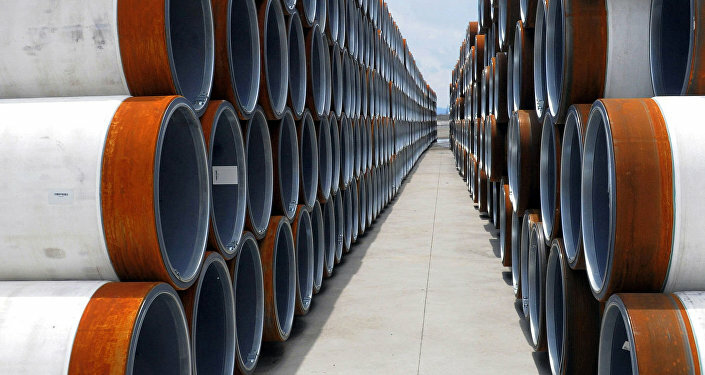 BELGRADE (Sputnik) - Serbia is ready to get connected to the TurkStream gas pipeline as this project will reinforce the energy security of the country and the region in general, Serbian Minister of Mining and Energy Aleksandar Antic said on Monday. On Monday, Antic visited Istanbul, where a ceremony of the completion of the sea section of the TurkStream pipeline took place. "The implementation of the TurkStream project will contribute to the overall energy security of this part of Europe. Serbia is ready to develop the continuation of the TurkStream with its neighbors," Antic said after a meeting with his Turkish counterpart Fatih Donmez as quoted by the ministry's press service. The Serbian minister noted that the gas pipeline will play a significant role for the region as a whole. "The possibility of the fact that from 10 to 15 billion cubic meters of Russian gas will flow from Turkey to Bulgaria, Serbia, Hungary and Austria is a serious chance for the development of energy security. This will open the possibility for the development of gas infrastructure and gas economy," Antic added. The connection to the TurkStream pipeline will allow the above mentioned countries to receive significant profits from transit of gas, according to the minister. The TurkStream pipeline project envisages the construction of a gas pipeline comprising two strings, each with the capacity to deliver 15.7 billion cubic meters (554 billion cubic feet) of gas per year. The first leg is set to bring gas across the Black Sea directly to Turkey, while the other one will run across the Turkish territory to its western border, transporting natural gas to countries in the south and southeast of Europe.